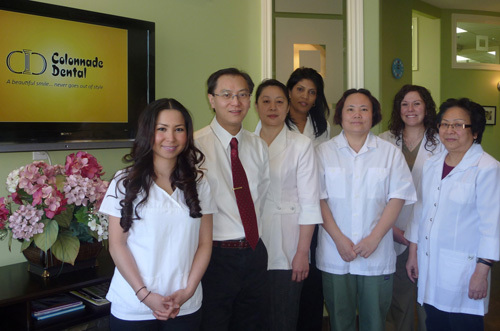 At Colonnade Dental, our diverse and dedicated team of licensed professionals and caring staff will ensure that your visit with us will be as comfortable as possible. We can’t wait to meet you! Kamlesh is the friendly face you will meet when you first step in our office. She has been part of our team for over 15 years and is fluent in English and Urdu. She is always happy to help you with any questions that you may have—from clarifying dental benefits to booking your next appointment. Mary has been with us for over 15 years and is the patient coordinator and office administrator. She is fluent in English, French and Creole, and enjoys creating Ikebana floral arrangements for the office and preparing healthy treats for the staff. She takes a special interest in getting to know people and will gladly help you with any administrative dental issues you may have. Teresa, a Registered Dental Hygienist from the Canadian Institute of Dental Hygiene, has been cleaning our patients’ teeth for over 10 years. She is passionate about providing her patients with exceptional service and will ensure that you leave our office with squeaky clean teeth and a bright smile. She enjoys gardening, decorating, cooking, meeting new people and is fluent in English and Vietnamese. Saphorah, also a Registered Dental Hygienist, is a graduate of George Brown College and has been practicing for over 10 years throughout the G.T.A. She enjoys working with people of diverse backgrounds and ages and it is this diversity and the smiles she gets after a job well done that keeps her passionate about her career. Outside of work she loves spending time travelling, camping and cooking with her family. She is fluent in English and Portuguese. Mei has been assisting Dr. How for over 5 years now. As a former nurse, she is very sensitive to patients’ needs and will make your in-chair experience a pleasant one. She is fluent in English and Mandarin.